I get asked the “how do you find the time to sew?” question a lottttttttttttt. I’m blessed to have a dedicated sewing space where I can leave my stuff out and come back to it throughout the day. The day I took these pictures I cut fat quarters while my youngest 2 kids slept…and in between making lunch and replacing band-aids I cut out some more. So by the end of the day I had all my fat quarters cut into pieces for a quilt. My oldest likes to get out his art stuff and have his quiet time while I sew…I should really get him a table. I rarely find a big chunk of time to sew while my kids are up. So my kids go to bed at 8, we tidy up the house, and then I usually sew or do computer work for an hour or more. This little gal is on my hip ALL day long…so unless I can do it 1 handed…it doesn’t get done while she’s awake. Which is OK…cause I’m in love with her. By finding small bits of time here and there to cut, make a block, or sew a row together…you’ll be surprised how much you can get done. You might even find you’re more productive when you know you only have 15 minutes to sew like mad! I wonder all the time how some of my favorite bloggers find the time to sew, decorate, have 6 kids, feed 6 kids, take pictures of 6 kids and then blog about it. I saw that on facebook and it made me laugh….and it made me glad that I live in this day and age. I certainly wouldn’t get any sewing done if I had to get my “hair in order” before I sewed! haha, love that old quote, crazy town! I completely agree – those little bits of time here and there really add up! And telling yourself "just 20 minutes" when you're perhaps feeling overwhelmed with your to-do pile is a great way to overcome inertia. Thank you for a great post! I don't have children and really can't understand how you mothers can arrange your time for everything. I have 3 dogs, but for them I can say, just wait now, I need to sew first! As you said, if we should have plates washed, clothes ironed and even lipstick – we could ever done any sewing! I'm happy that you find those short moments to create and to sew all the beautiful things, you make! Thanks for that funny quote from Singer! It's at least a little bit true even though we've progressed since then…. That sewing manual quote totally cracked me up! Put on a clean dress?! It's nearly 1 pm and I am still in my PJ's! LOL! This is awesome, thanks so much for sharing. I think my problem is that I don't take advantage of small pockets of time, cause I like to have a big chunk of time to really go at it, but then I wait around for that time, alot! Great post Allison. That old quote is hilarious. Man I'm so glad I didn't live back then. If my house had to be clean before I sewed, I would pretty much never sew. It's so true-having a spot where you can leave the work-in-progress undisturbed makes a huge difference. We all find the time where we can and I love the little snippets we all share of our daily lives amidst the fabric. It's all about living a life well-lived. Our kiddos are grown and we are adjusting to an empty nest. New adventures lie ahead, but oh how I envy you having that precious little one on your hip and the sound of children creating at your feet. I miss that. I just moved my sewing machine into my kids play space, and I love it! After a few days, they no longer wanted to touch the machines– and I can get so much more done! Glad to see I'm not the only multi-tasking mommy. You are wise beyond your years! I had a cottage painting business when our girls were growing up. I also worked 2 days a week, so like you I made the most of every available moment. Now that our children are grown and gone, I'm much more UN organized! lol! I love that little piece of history you found!!! I totally do what you do with snippets of time. It all adds up doesn't it! Funny I find folks who "would never have time for that" watch a lot of tv! Tv is such a time waster, I listen to it but rarely watch it. I will never show that quote to my husband. Ever. Holy Crow. I satisfy exactly none of the points on the vintage sewing advice. It's ok since I also have none of the important concerns about visitors or husbands arriving amid chaos. Hoo boy. Good advice. But pretty funny when compared to my reality. it's awesome how to manage to squeeze sewing in anywhere. because of my limited sewing time, i've considered getting up early and doing some before work… i am just a little recently obsessed. Thank you for your post today. 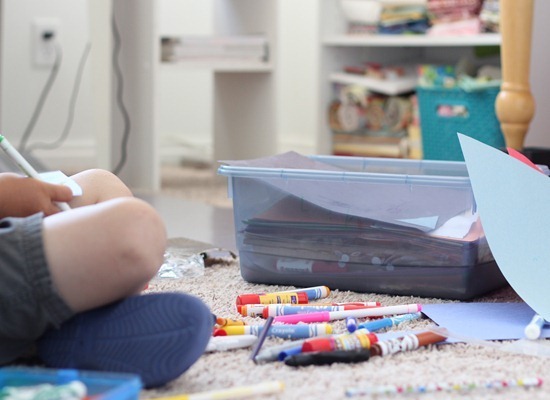 Making time for something you love is something that I want to past down to my own children and like you, having a designated space and using those small spaces of time has really helped me this past year. OMG that totally cracked me up. Dishes always wait until just before bedtime, I don't own any dresses and I most certainly don't answer my front door in the middle of my sewing, unless of course it's the UPS man with more fabric!!! wow, that is ridiculous! I don't even know what dusting my nails with chalk would entail? And in my house, sewing beats out chores every day. Allison! I love the old singer advice! Ha ha ha. Has me cracking up! I am about to be a mom for the first time (2 weeks to go) and have some concern about finding time to keep quilting. Your posT gives me hope! Thanks!! This is also the only way I get sewing done, unless one of our parents is feeling generous to give me a few hours to myself for just sewing! 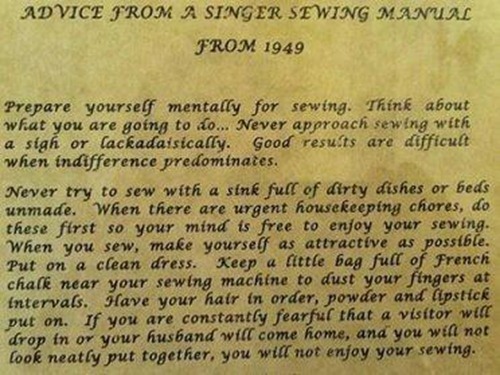 I love the singer sewing advice. It is so true, but it never happens that way! The last time my husband saw me in a dress and wearing lipstick was our wedding day! Your post rings so true, when you love what you do it shows and you will do anything to find time to do it, even if it's only 5 minutes while waiting for the water to boil. Like you my projects are never far from the goings-on of the house so I can always pick up a bit here and there and before you know it it's complete. Lovely summary, thank you for keeping it real. Love the post! So true to everything your wrote! Thanks for inspiring me to get 15 minutes in here and there. Great post. Currently, I wait until the little one is in bed. But she has been seriously into practicing her letters lately so I might just try to sew while she is awake one of these days. Her ability to focus has definitely increased. I need to find more time to sew. I'm sharing that photo on my fb http://facebook.com/sewmuchtosay becuase its so funny! I read that quote before and I always get a giggle. I sew when I can, avoiding the housework as much as possible with my kiddos' constant interruptions. My 2 older (9&7) want to sew, which means I cut, pin and they find things to get into. My 3 year old is usually somewhere on my shoulders or climbing up my back. I have to admit that even with all the caos it is still where I go for sanity. When my friends and family ask where I find the time to sew, I laugh and just say, "I go lock myself in the sewing room and give myself a 'timeout'." Lol! I read the Singer bit aloud to my husband and he sure chuckled…I sew often in the early AM wearing my pj's, bedhead hair and no lipstick or powder in sight! Enjoy your Littles now, time goes by very quickly, mine is in college and I have tons of time to sew, but it's not the same as being creative and thrifty with your time and having those sweet voices and faces looking for your dedicated time that's just for them! 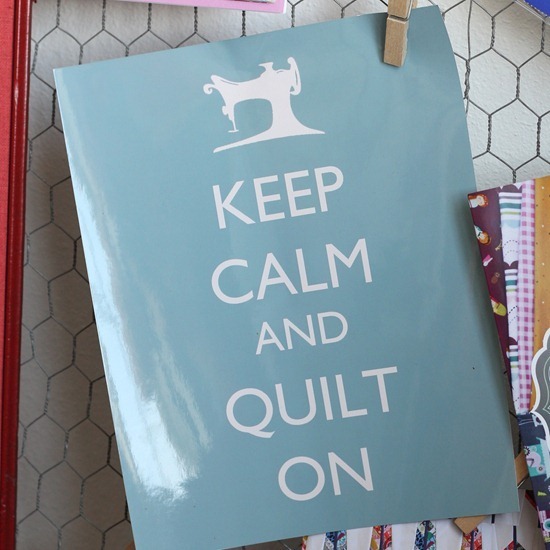 Love the quote, I often love to sew or craft in my pj's in the school holidays, so would definitely failed. I, too, am lucky enough to have a dedicated space for sewing. Try to keep it straightened up so when I do want to sew, I don't have to clean up. The advise is too funny! I do have to say that it's sort of true ~ tho I don't put on lipstick or make sure my hair is arranged ~ I like to sew in my pj's! My issue is the internet. I could get so much sewing done if I just turned off the darn computer! thank you for the GREAT post! I am full time wife and mom to 4 with a day job :) I love the glimse into your reality. I never thought to set up the bigger ones under my table… My boys would love it! Thankfully the singer manual writer has never been on a retreat! The pressure to be in perfect order before sewing would ruin the get up and let your roommate sleep in while yougo to sew until breakfast! After reading this the other day, I was going to my craft room to work on a quilt, my husband piped up and said that I could wash his glass right then so that there would be no more dirty dishes and I would be more at peace sewing. great post! I, too have 3 munchkins and am a wannabe full time quilter. My 4 month old sleeps 3 hours every day-thank the heavens. This is my sewing time (housework be damned). My middle girl (4) crafts with me in my sewing room, and my eldest was in school and now, she's often doing her own thing or crafting with us. I neeeeeed this time to myself for my sanity. It makes me a better Mom, and a happier Mom. That is hilarious. I will have to share on my FB! I sew and work during those same times! Great advice! I frequently sew in the midst of doing 'chores' I clean a bathroom and reward myself with making a quilt block. Or I put in laundry & sew while I 'wait' for it. lol. I can talk myself into sewing so easily! I also wanted to thank you & tell you I just loved making Seville! Was the most delightful three days of hard work I've had in a while. You can see it on my blog too! What a quote! I do like you, sewing bit by bit, stealing time and working when I can; many times leaving dishes in the sink and beds undone! Of course, no lipstick nor tidy hair! Wow! That snippet from 1949 is a riot. 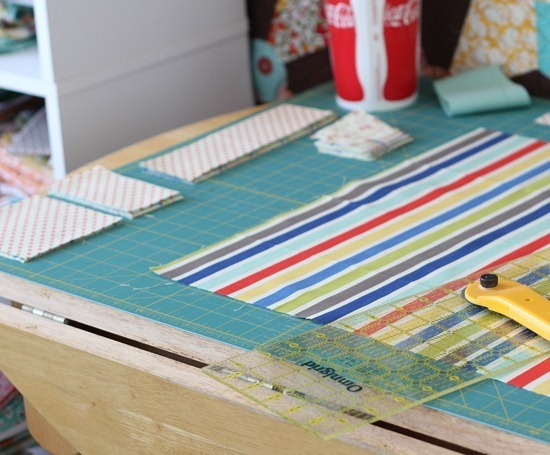 Thanks for sharing your sewing process :-) Found time is the best! That is so funny! I would never get anything done if my hair had to be done or if I had to change out of my stretchy pants! thats the only way i can do things is little bits here and there. Can't believe how big little girl is…seems like she was just born. She is so cute!! have a good week!! LOL at that quote! I got into all of my creative pursuits–stitching and quilting–after my twins were born & my daughter was 3. They're all in high school or college now and I can't believe how fast the time has flown. I did everything in snatches and stolen seconds. Many a quilt was made to the sound of Sesame Street or a Batman video! Give that baby and her brothers an extra cuddle because while it was crazy, I would love to go back in time and kiss my kids' baby cheeks one more time. :) Your daughter is a beauty, btw! Your post has got me laughing! I love it. It definitely is true how much you can get done with just the spare time you have throughout the day here and there. Thanks for the post. It is so good to hear about how other people fit their passion in such a very busy busy schedule. Especially with little ones. I hate how my mommy guilt runs rampant sometimes! thank you. A week or two ago I made a cover for a book in this manner: cutting and sewing little bits in many sessions. But it is nice to read how someone with little kids (too) manages to sew "so much". Thank you for the post. Love your post…it is so difficult to fit it all in! My husband thinks I've worked soooo hard that he takes over the care of No.5 and I get some peaceful, guilt-free crafting and blogging done! Hahaa! It might seem mad….but there's method in there! Love your blog, been a while since I visited, but still love it! Nice post…but my favorite is that you do not complain that your children take your time and that sweet girl is on your hip all day. Your children will arise and call you blessed one day! Nancy of Sewing with Nancy wrote a book called 10-20-30 minutes to sew. It helps you organize your sewing by blocks of time. A system I still use and I read it many years ago! Great post! The vintage instructions made me crack up, there's no way any sewing would get done around her if my house had to be spotless first! So, you don't "find" time, you just make time! I stumbled across your blog looking for a tutorial on how to make camera strap covers. I have fallen in love with all the wonderful tips and ideas you bring to the table!!! I also LOVE the 1949 clip and have put is as my backdrop for my iPad!! I just wanted to say thanks for taking the time to share wi all of us your wonderful craft and ideas!!! Oh my gosh! I "pinned" the Singer quote picture – just had to share it with the world! That quote from 1949 is amazing. Thank you for sharing that! I cut in my kitchen and that's exactly how it happens too. All through the day. I just hate when I'm not done by dinner. I either have to clean up or we eat out. 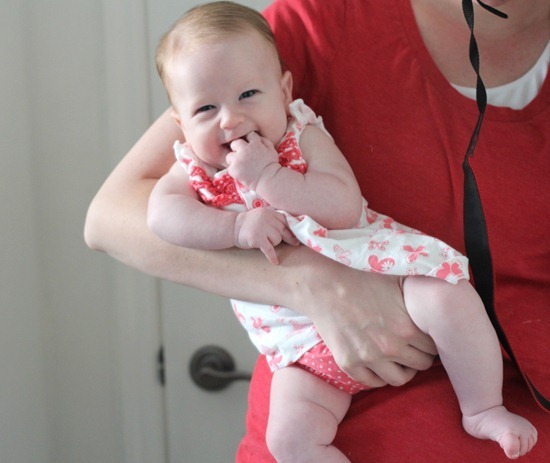 That baby girl is the most delicious love chunk. What a sweet smile! BTW, I love your big coke cup on your cutting table. That is what is almost always in my pics too.